What’s a “Fair Share” for Upper-Income Taxpayers? Barack Obama and the rest of the class-warfare crowd act as if “tax the rich” is an appropriate answer to every question about fiscal policy. I’m not joking. Here are some of the President’s main tax hikes that have been enacted or proposed. Obama imposed higher income tax rates on upper-income taxpayers as part of the fiscal cliff deal. Obama also succeeded in increasing the double-taxation of dividends and capital gains for successful taxpayers. Obamacare was a budget-busting nightmare with lots of tax increases, but the biggest tax hike targeted rich taxpayers. Obama’s proposed solution for Social Security’s huge unfunded liability is a large tax increase on taxpayers making more than $100,000 per year. Obama also has proposed big tax hikes for American companies trying to compete in global markets. Needless to say, that’s both tiresome and empty. At some point, it would be nice for Obama and other statists to actually identify how much is enough. For instance, should any taxpayer ever have to give more than 40 percent of their income to government? More than 50 percent? Perhaps over 100 percent, like the 8,000 French household that had every penny of earnings confiscated in 2012? And what’s the “fair share” for the rich? Should they pay 40 percent of the tax burden? Or 50 percent? Or more? Heck, it might not be a bad idea to actually identify the rich. Is a household “rich” if annual income climbs above $200,000? Or do we simply define rich people as being anyone in the top 10 percent, or top 20 percent? For what it’s worth, I don’t care about the answers to these questions because I favor a simple and fair flat tax that doesn’t punish people for contributing more to the economy’s output. I simply want the government to treat everyone equally and collect revenue in the least-destructive manner. That being said, I imagine that Obama and other leftists would hem and haw if any reporters actually acted like journalists and asked tough questions. In their hearts, the class-warfare types probably want to go back to the 70 percent-plus top tax rates of the Jimmy Carter era. But they presumably wouldn’t want to openly confess those views. Just in case Obama (or Pelosi, Reid, etc) ever are pressed to answer these questions, here are numbers that should help put their answers in context. First, here’s a chart from the experts at the Tax Foundation and it reveals that the top-10 percent of taxpayers finance about 70 percent of the federal income tax. The typical left-wing response to this kind of data is to complain that it doesn’t include the Social Security payroll tax and other levies. That’s a semi-fair point, and it’s true that the so-called “FICA” tax (at least the part that goes to Social Security) is not “progressive.” Instead, it’s a flat-rate levy. Moreover, the portion of the payroll tax used to fund Social Security is only imposed on income up to $118,500, which leads many leftists to say the system is regressive. That’s inaccurate for the simple reason that Social Security’s benefit formula is far more generous to lower-income taxpayers. It’s also worth pointing out that the program is supposed to be a form of social insurance, not a redistribution scheme (though it’s actually both). And that point is a perfect segue for the next chart. 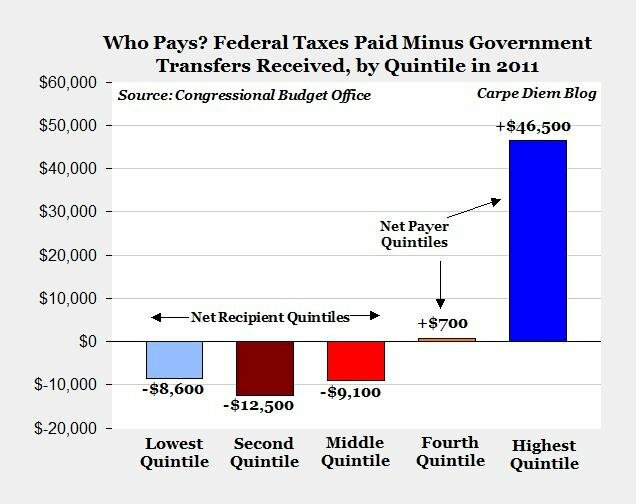 Mark Perry of the American Enterprise Institute used numbers from the Congressional Budget Office to measure the net effect (taxes and spending) of fiscal policy for the five income quintiles. As you can see, the bottom 60 percent are net recipients and the top 20 percent are basically pulling the wagon for everyone. 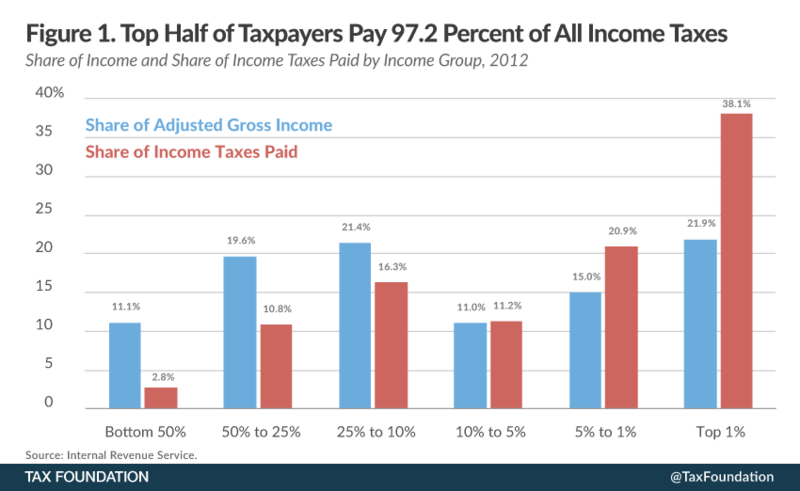 Remember, this chart doesn’t mean that the bottom 60 percent don’t pay any tax. It just means that they get more money from the government, on average, than they put into the system. Now that I’ve shared some numbers, let’s close with some economic analysis. Obama’s class-warfare agenda is wrong because it’s unfair and discriminatory. But it’s also terribly misguided because high tax rates are bad for growth and competitiveness. Besides, there is a point at which high tax rates don’t generate much, if any, additional revenue. Simply stated, rich taxpayers have considerable control over the timing, level, and composition of their income. And that means they can reduce their taxable income when tax rates increase. 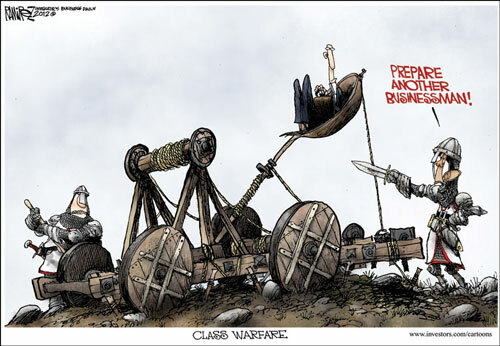 My video on class warfare has more information. Make sure to pay extra-close attention at the 4:35 mark. P.S. If you don’t believe my argument about rich people having the ability to alter their taxable income, check out the IRS data from the 1980s. P.P.S. Only a fool (or a malicious person) wants to be at the revenue-maximizing point of the Laffer Curve. The right goal is to set tax rates at the growth-maximizing level. P.P.P.S. For what it’s worth, a poll in 2012 found that 75 percent of Americans think the top tax rate should be no higher than 30 percent. That can’t be very comforting data for the hate-and-envy crowd. This is one reason liberals should advocate a flat tax or a national sales tax. A fair share percentage wise if we had a flat tax would be 10% on all incomes above the poverty line. All deductions would be scrapped with the exception of the deductions for home mortgage interest, health insurance, business purchases and charitable donations. Everything else goes. I think focusing on federal income tax only is a mistake. This is only 48% of federal revenue (2013) and once state and local taxes are taken into account, it’s only 25% of the total tax take (fed = $3tn, state and local $2.7tn 2014). So who pays the other 75%? There’s strong evidence that corporation tax is passed on to employees as lower wages or worse, lower employment. Ditto sales taxes. State income taxes are in general less progressive than the federal structure. And who gets the subsidies? If someone pays $100k in taxes a year but the government increases the value of their house by $150k, are they net contributors or net beneficiaries? It’s not as simple as it seems. At least the US has high property taxes – the least damaging of taxes. If this could be converted to a land only tax, no damage would be done and you could eliminate taxes on labour, turnover and profits altogether. And of course the argument about FICA is questionable in my opinion. There is no way that someone in their 40s paying FICA now will get anything near the promised benefits – Social Security and Medicare are tens of trillions in the red due to demographics. Shouldn’t the laffer curve have a “Growth reduction point” or something of that sort to emphasize the negative effect of overtaxation? It only refers to the government’s income, but could easily show the negative effect the same has on economic growth. I suspect that point would be very close after the point of maximum revenue. Or- perhaps even before it, or co-incidental. I suppose it is possible that prior to maximizing revenue, the government may already be having a negative effect on growth due to the regulatory aspects of their collection methods. What makes the “fair share” talk all the more irritating, at least for me, is the incessant dishonest pairing with “ask”. Example: “The Buffett Rule Asks the Wealthiest to Pay Their Fair Share” (http://www.whitehouse.gov/blog/2012/04/10/buffett-rule-asks-wealthiest-pay-their-fair-share). This euphemism is no doubt well focus-grouped. But politicians who use it display an utter contempt for the intelligence of their audience. Mr. Mitchell, Great article, as usual. What is wealthy is my question? At 74 and retired for 2 years, I don’t feel rich until I see how people live in some horrible areas of the world and when I pay income tax to Feds and Connecticut. It may make sense to some to sock the rich, but the middle class are getting socked too. Thanks for your continued insight.